In this episode of #AskPaulKirtley, I answer questions on bushcraft qualifications and what you need to do to start a bushcraft company, where to store your bushcraft knife and firesteel so that they don’t corrode, burning rubbish in the campfire and cooking starches found in tuberous roots when foraging. love these q and a videos but today was training my nightvision. 🙂 Glad you enjoyed it Cees (even if you couldn’t see it!). Another interesting Q&A session, well done, I enjoy listening. Regarding teaching bushcraft, qualifications and the neccesary people skills I can see pros & cons in having national qualifications, I have attended accredited courses with John Rhyder, highly recommended, and NCFE courses in outdoor leadership, session planning, teaching and learning styles, as well as a variety of bushcraft courses plus a few years at college gaining diplomas in countryside skills, countryside management and woodland management all of which lead me to my role where I have spent many years teaching outdoors and practicing my wilderness skills, however the subject is vast. I think in all walks of life there are people whom may be not sincere about their knowledge, with bushcraft I think this is sometimes a naivety of how much subject matter needs encompassing in that knowledge base, ie as you have said, dropping a spark on to cotton wool and putting up a hammock does unfortunately make some people believe they are skilled enough to share/teach these skills, but if you become very proficient at this then by all means share but there seems to be those that will then blag beyond their skill set. If you know some knots you can share with the Cubs, then fantastic, I believe in teaching at your level, we’ve all shared and learnt this way but this is where honesty comes in, keep it honest and at your level. Knowing basic fire, water, shelter and food can be a great and fun lesson for primary children but as you will know Paul we really need to be raising the bar to be instructing these skills and a huge ammount of knowledge is needed. I am aware of people gaining the basic NCFE level 2 competency certificate and calling themselves instructors after a weekend in the woods, they’re a lot like the people with £400 knives and no sharpening stone! So let’s all be honest, share what we know well and be ready to say you don’t know, with my Cubs or wildlife watch group I take the opportunity to say let’s find out together and we all learn but running a school clearly needs knowledge backed by experience in a wide range of skills.. I completely agree with what you have written in your comment. Integrity and honesty are invaluable in any discipline, whether there is certification available or not. Teaching at your level is indeed the key and if everyone did, then it would keep the industry honest. This only takes us so far, however, as it is an inside view, the view from the perspective of practitioners observing other practitioners. It doesn’t fully solve the problem presented to a beginner looking in, rather than an instructor looking out. When you put yourself in the position of a customer looking to choose a provider, how can they judge the level of the instructor and which level of instruction suits them? Great programme and I’m pretty sure I recognised the location! On the raw food I’m sure more calories are burned both chewing and digesting uncooked veg in particular. Also aren’t potatoes toxic when raw especially the green bits? Enjoyed the episode as always – plenty of good information. For what it’s worth to others – firesteels can be protected by a quick rub over with an old candle, axe blades etc – a thin coat of linseed oil after cleaning and sharpening. These methods work for me when gear is stored in the garage for any length of time. Keep you a gawn bor! Yes, I’d forgotten about the old candle wax trick. You’re right. It does work very well. I’ve also used linseed oil on axe heads, when adding a coat or two to their handles and having nothing else to hand for the heads. It’s a good single source solution for protecting the whole axe. Glad you are enjoying the episodes. Thanks for your positive feedback. Great Q & A, was very interested in the storing of knives, Axes and even Ferro Rods, I have taken to removing my knives from their respective sheaths, leather or otherwise, putting a little fine oil on them and wrapping in an old cotton shirt/cloth. I have had no pitting or rust develop over the last year or so. Thanks again for these episodes, wonderful stuff. Thanks so much for your reply to my Speak Pipe question. I was conscious that I’d made it too long, and I had a couple of goes at recording it before I realised that I just couldn’t get to the point in a non-rambly fashion LOL ! You thoughts and views on this topic seem very much like my own. The podcast you mentioned is about the only one of yours I’ve not yet heard – I will go ‘do’ very soon. Great reply very interesting and helpful. Many thanks. You are very welcome. I’m glad you found the answer useful and interesting. 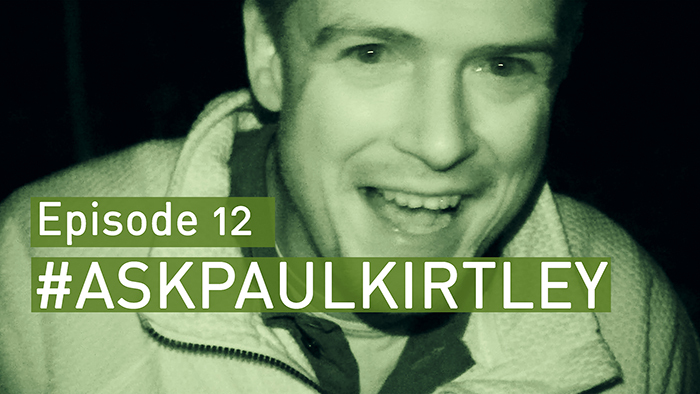 You’ll definitely get a lot out of the conversation with Alyssa Crittenden in Paul Kirtley Podcast Epsiode 10. Drop me a comment there once you’ve had a listen to let me know what you think. At this present moment I have a couple friends at Buxton, the University of Derby. Doing a BA (Hons) Outdoor Leadership and Management* this could be used as a stepping stone as you be qualified to teach some aspects of outdoor life. Myself with navigation on more than confident with what I can do but recently I paid for a advanced navigation course to sharpen my skills I will say I did pick up some more new knowledge and to go through the knowledge already knew makes a difference. There is a difference from picking up a book or watching youtube clip to learn different aspects of actually practicing what you read about or seen paying for someone to show you how you can make a big difference, that can show you the right way or put you on the right track if you’re doing it the wrong way and a good teacher can only show you some tips to get the best out of what you do. Yes, you make some good points too. There is value in paying for instruction from experienced tutors who also are skilled in teaching. This is something I’ve always done and continue to do in various areas of my outdoor life. Loved this episode. Please don’t take this the wrong way but watching you disappear into the darkness and then realise you had night vision available was really funny. To me it shows what an honest person you are. I can think of a few others in your field who wouldn’t have the courage to show the video unedited. Funny or not it was a pleasure to listen to your wise words as always and many thanks for the knowledge you continue to pass on. The thing was for a lot of the time I could see OK but I realised the picture on the camera was a lot darker. Anyway, as you realise, it’s largely about what I say on these shows, rather than what I do, so I’m glad it didn’t detract from the experience. Thanks again and glad it made you chuckle.